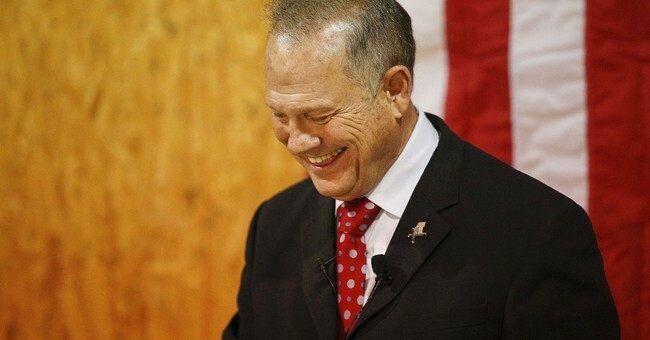 With just one week until Alabama voters heads to the polls for the special Senate election, the Republican National Committee has reversed course and is supporting GOP candidate Roy Moore once again. The move comes after President Trump endorsed Moore on Monday with a pair of tweets about the election, arguing the GOP can’t afford to lose the seat to a Democrat. “Democrats refusal to give even one vote for massive Tax Cuts is why we need Republican Roy Moore to win in Alabama. We need his vote on stopping crime, illegal immigration, Border Wall, Military, Pro Life, V.A., Judges 2nd Amendment and more. No to Jones, a Pelosi/Schumer Puppet!” he wrote. “Putting Pelosi/Schumer Liberal Puppet Jones into office in Alabama would hurt our great Republican Agenda of low on taxes, tough on crime, strong on military and borders...& so much more. Look at your 401-k’s since Election. Highest Stock Market EVER! Jobs are roaring back!” he added. Moore, who in recent weeks was accused of inappropriate sexual behavior with underage girls when he was in his 30s, was grateful for the president’s messages, tweeting his thanks. The RNC, which had cut ties with Moore three weeks ago after some of the initial allegations against Moore came out, opened the financial spigot hours after Trump’s endorsement. Breitbart was the first to report the RNC’s change of heart, and an official later confirmed their involvement in the race to The Hill.